Uber driver salary: The ride-sharing company says its drivers make great money, but its math just doesn’t add up. The ride-sharing service says its median driver makes close to six figures. But the math just doesn’t add up. An Uber driver waits for customers in his car in Beverly Hills, California. Lately though, as fares have fallen and Uber’s own commissions increased, drivers have grown disillusioned with the company and its promises. From London to San Francisco to New York, they’ve banded together to protest against Uber. The rhetoric they once saw as uplifting now seems deceptive and manipulative. Slowly but surely, Uber drivers are questioning whether Uber’s promises about wages and “small business” opportunities are actually aligned with reality. And in New York, the birthplace of this grass-roots labor movement, $90,766 is starting to flicker out. When I meet up with UberSUV driver Abdoulrahime Diallo at a Starbucks in Manhattan’s Flatiron District, it’s a Wednesday morning, but he has time to chat. Instead of scouring the busy streets for passengers, he and Jesus Garay, a driver for UberX, have turned off their Uber phones as part of a daylong strike over recent cuts to fares and alleged poor treatment by the company. In London, drivers are doing the same while in San Francisco and Los Angeles they’ve gathered at Uber headquarters to protest. Here in New York, Diallo and Garay are helping to coordinate the strike as organizers of a nascent group called the Uber Drivers Network. This is the latest in a series of recent protests against Uber. Over the summer, Uber lowered fares by 20 percent in a bid to make its service “cheaper than a New York City taxi.” Drivers, they said, would benefit from increased demand, lower pickup times, and more trips per hour—factors that would more than offset a drop in prices. “They’ll be making more than ever!” the company wrote on its blog. In late September, Uber announced that the experiment had been a success and that it was keeping the lower prices in place. Josh Mohrer, the general manager of Uber in New York City, tweeted on Wednesday that the average Uber driver in the city is netting $25 an hour after commission and sales tax. 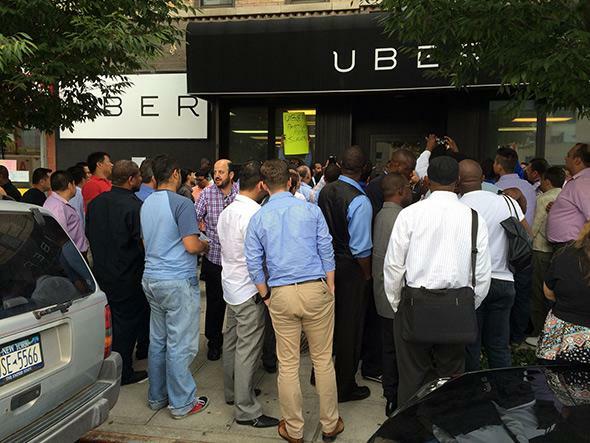 Drivers gather outside Uber’s New York City office to protest in September. The costs that he’s talking about are ones that all drivers, as independent contractors for Uber and licensees of the city’s Taxi and Limousine Commission, have to pay. New York is among Uber’s biggest markets and it offers those riders three different tiers of service: UberX (the cheapest), UberBlack (the middle), and UberSUV (the most expensive). 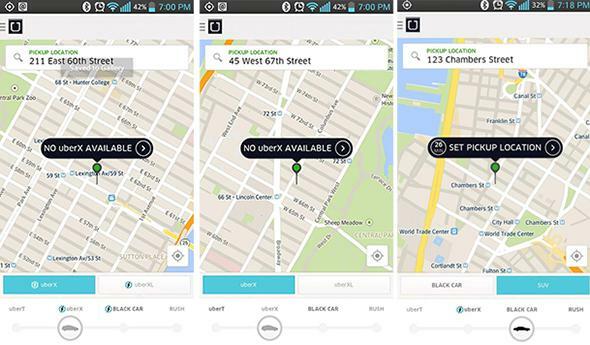 On each of these fares, Uber takes a commission: 20 percent on UberX, 25 percent on UberBlack, and 28 percent on UberSUV. From that fare, the city also takes a sales tax of 8.875 percent and the Black Car Fund takes a fee of 2.5 percent. For a driver like Garay, all those deductions mean an initial $30 in fares leaves him with about $21 for the hour. According to statements Garay provided Slate, he made $1,163.30 in fares for 40 hours of work in the week ending Oct. 13. From that, he took home just under $850. In any given week, Garay expects to lose a bit more than $350 to gas, car cleanings, insurance, maintenance, and parking costs. That leaves him with about $480 before income taxes. Effectively, he’s making $12 an hour. Twelve dollars an hour isn’t terrible. But it’s a far cry from the kind of numbers that Uber advertises to drivers on its platform—the numbers it uses to paint itself as empowering contract workers in the sharing economy. The statements themselves are also confusing. A diagram in Garay’s statement shows he worked 40 hours, but a note below it says his “hours online” were just 32.8. He tells me it doesn’t make sense. The trick is that Uber is referring to two different kinds of hours: those spent online (available on the app) and those spent with actual customers in the car. When drivers think about hours, they think about the first kind—hours spent on the app looking for rides. But when Uber breaks things down, it’s interested in the second—hours shepherding passengers. Uber and its drivers have fundamentally different notions of how drivers’ time and effort should be measured. And as fare cuts have made profit margins slimmer all around, those differences have increasingly led to clashes. 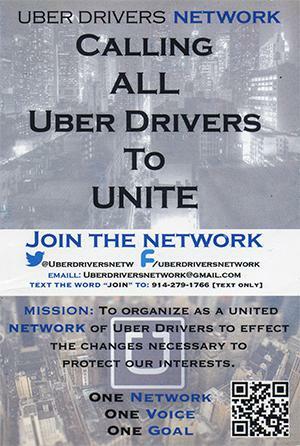 A flier for the Uber Drivers Network. As the drivers have banded together, a crucial question has emerged: In the sharing economy, in which a company like Uber serves primarily as the middleman between service buyer and service provider, who holds the true power? Thrown into the race without a clear answer, the three main companies in the field are using one of two strategies to build out their platforms. First, there is Uber’s: cut prices to please the consumer. Lyft, another major player in the ride-sharing game, has operated similarly to Uber; the two are engaged in something of a race to the bottom to draw in customers (and Uber, at least, believes that race will also lead to more fares and more money overall for drivers). The third contestant, Gett, has taken a different approach: raise pay to please the driver. “Drivers are crucial, obviously, to this equation,” says Ron Srebro, CEO of Gett USA. “You have nothing without customers, but you have nothing without drivers.” Two weeks ago, Gett announced that it would pay drivers on its platform a flat rate of $0.70 per minute—an amount it said would double the typical rate for drivers on Uber and Lyft. Considering how fast Uber has grown and changed—and the sheer number of people it employs—it doesn’t seem so odd that worker protests were in its future. But Lane Kasselman, Uber’s head of communications for the Americas, isn’t interested in discussing that. “We look at it differently,” he tells me. “Drivers are our customers. They’re the ones that are licensing the software and—fundamentally from Uber—are getting regeneration and marketing, and getting small business tools. “We’re creating 50,000 new jobs through our platform every month,” Kasselman continues. “Drivers are excited about the economic opportunity that’s happening.” I mention the previous Wednesday’s protest. “There were no protesters in New York, Chicago, or D.C. at our offices, and literally only a handful in L.A. or San Francisco,” he says. “We saw no impact to supply in New York … there was no unusual pricing.” This last claim directly contradicts what the Uber Drivers Network reported on its Facebook page. In a series of enthusiastic posts, organizers shared screenshots of several Manhattan neighborhoods showing 20-plus minute waits for an UberX and some areas where no car was available at all. Kasselman emphasizes that drivers on Uber’s app earn an average of $25.79 per hour in New York after Uber’s commission. He’s not sure if the sales tax is included in the commission or taken separately, and suggests I contact the Taxi and Limousine Commission to ask. (I do; they direct me back to Uber.) I relay to him that Uber drivers say the 20 percent cut to fares is unsustainable, that after commission and tax and fees they’re barely scraping by. Uber disagrees. Kasselman refers me to the late-May blog post, the one claiming that the median UberX driver in New York City was making an annual income of $90,766. That’s a lot of money. Even in New York City, those earnings alone would put you safely in the top 30 percent of households. I suggest to Kasselman that this figure seems unlikely to still be true, especially since the fare cuts kicked in. He reiterates that lower fares have increased ride volume so that drivers are now making more than ever. That said, even at $25.79, $90,000 is a tough mark to hit. You’d need to work 70 hours a week for 50 weeks a year. In several months of reporting on Uber, I have yet to come across a single driver earning the equivalent of $90,766 a year. Those I’ve spoken with report that they gross around $1,000 a week after commission and sales tax—but before gas and other expenses—for annual income closer to $50,000. And despite broadcasting the $90,766 figure far and wide, Uber has so far proved unable to produce one driver earning that amount. Even the driver Uber itself put me in touch with, Adam Cosentino, wasn’t working at that level. Instead, he’s putting in 30 or 40 hours a week while he gets his MBA, optimizing for the busiest hours and bringing home between $800 and $1,000 a week. He’s happy with it. He spends about $200 a week on gas and $30 on cleaning. Another $300 toward the car. After commission and whatnot, he’s left with maybe $400 or so for his efforts. It’s great for Uber that he believes that, but it’s also odd that these $90,766 drivers are so hard to come by. After all, that’s the median according to Uber’s data, which means that by definition half of its thousands of drivers in New York City should be earning that much or more. And I was desperate to speak with one of these drivers. I wanted to see the true Uber dream. So I asked Kasselman to find me just one. Find me Uber’s unicorn. Last I heard, they’re still looking.